Great team to work with - Zach did an outstanding job to make sure our stay was a positive and memorable experience. Little details make a difference and Zach I know went out of his way to provide those. So Thank You Zach for a job well done!! What a beautiful property. Every room welcomes you with a view. There is nothing better than waking up to a gorgeous sunrise over the mountains and watching the deer graze outside the window. The house is immaculate, very tasteful and well appointed. Can't wait to come back again. Zach was extremely accommodating with our reservation as we made a last minute decision to visit our son. My credit card was denied due to a glitch on Thursday night and we were to arrive on Friday. He called at 8:30 AM on Friday morning as he told me he would. Everything worked out great...could not have been happier. He knew we were going to be getting into town later that evening so he went to property to turn the heat up for us. I will keep Zach's phone number for future reference as I anticipate visiting a few times per year. This was a wonderful home to spend our family Christmas with our son who attends MSU. We were able to have family dinners, bake cookies, ski, hike, watch movies and experience the lovely city of Bozeman. Zack was very professional in answering all our inquiries. A malfunctioning window latch was quickly replaced. Kay and I visited Bozeman for 6 weeks in September and October, and loved every minute of our stay at the Trail Runners Bliss! A little air conditioning made our early days very enjoyable, followed by the fireplace later in October. The hiking trail adjacent to the house was convenient, and the trail itself was beautiful, especially along the North fork of the Gallatin. On our last day I fished the Gallatin from Manhattan to Logan and caught several nice rainbows. The house is perfect in every respect, we look forward to visiting here again next year. We felt right at home. 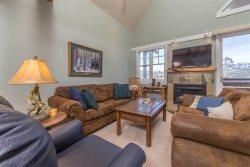 The house is clean, equipped with everything you need and situated in a wonderful quiet neighborhood minutes from downtown Bozeman. We would love to return!